You're the inquisitive type, aren't you? I like that. The Man From Beyond puts you at the heart of a story, but it is also a game. Our gamemaster has leaked the following trade secrets to help you make the most of your time with us. The room contains challenges, all of which you must complete in time. Ask why. Why is this here? Almost everything in the room is important. Explore. Use your eyes, ears, and hands. Read. Check all sides of an object. Objects given as rewards are particularly important. A key works only in one location. Once the key unlocks a reward, that key has served its purpose. If an object needs a code to open, the solution will not involve guessing. Have faith. You will know the answer when you have it. Talk to one another, and play as a team. If you don’t “get it,” share it. Don’t shy away from asking for a hint when you need it. 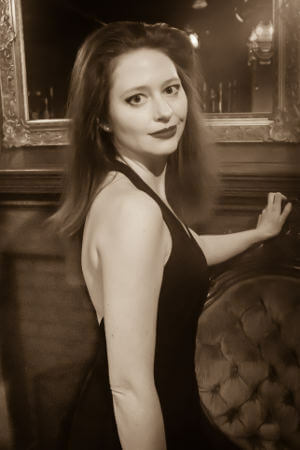 Haley E. R. Cooper (Madame Daphne, Co-Artistic Director) is a Houston-based actor and theatre creator. She is proud to bring the intimate thrill of immersive theatre to her hometown. Recent Houston acting credits: Sanders Family Christmas (June) and Blithe Spirit (Edith) at Texas Repertory Theatre; As You Like It (Rosalind), Comedy of Errors (Adriana) and Midsummer Night’s Dream (Hermia) with Shakespeare in the Shade. Directing credits: Hamlet and Merchant of Venice with Rice’s Baker Shakespeare program. After earning her B.A. at Rice and her M.A. in intellectual history at the University of Wisconsin, Cooper pivoted from academia to the arts and hopes even stranger things may yet happen. She plans to continue exploring new ways to give audiences agency with Strange Bird Immersive. For a behind-the-scenes glimpse, check out Immersology, her blog dedicated to the theory and practice of immersive theatre. 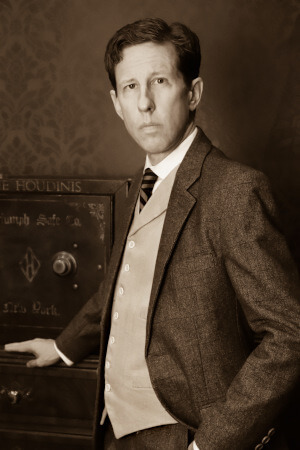 Bradley Winkler (Harry Houdini, Sound Designer) is a Houston-area actor, sound designer, director, and playwright. He was last seen as Aryeh Lev and Jacob Kahn in My Name is Asher Lev at TheatreLaB Houston. Other recent Houston work includes Devil Dog Six (Landing Theatre Company), The Importance of Being Earnest (Classical Theatre Company), King Lear (Classical Theatre Company and Prague Shakespeare Company), Sylvia (Texas Rep), The Boys Next Door (Dionysus Theatre), and Troilus and Cressida (Trebuchet Players). His sound designs have been featured at Classical Theatre Company, A.D. Players, Houston Family Arts Center, and HCC–Southwest. Brad has also acted and directed in his native Milwaukee, and his stage adaptation of Corrie ten Boom's The Hiding Place has been produced at theaters around the United States, Canada, and the U.K.
At Texas Rep: Of Mice and Men (Slim) and Greetings! (Andy). For Back Porch Players: Tea and Sympathy (David Harris). Touring: Leaving San Jacinto (Sam Houston). For Shakespeare in the Shade: As You Like It (Jaques), Comedy of Errors (Antipholus of Ephesus), and Midsummer Night's Dream (Demetrius). Directing: Hamlet and As You Like It for Baker Shakespeare at Rice University. He also engages in scenic and lighting design. located to Houston after graduating with a BFA in Musical Theatre from Sam Houston State University with an emphasis in acting. She has been actively working in the Houston theatre scene since. 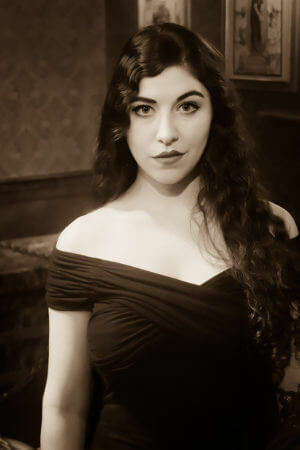 Amanda is most thrilled to become a company member with Strange Bird Immersive. Credits include: Unity Theatre: A Grand Night For Singing (Lynne), Little Women (Meg); The Pearl Theater: Eurydice (Eurydice); AD Players: The Lion, The Witch, and The Wardrobe (The Witch), Little Women (Meg); Main Street Theater: Holes (Kate Barlow), A Charlie Brown Christmas (Lucy), Bunnicula (Chester), Harriet the Spy (Harriet), Pride and Prejudice: A Romantic Musical (Kitty), Lilly’s Purple Plastic Purse (Lilly); Stages Repertory Theatre: Xanadu (Erato), Road Show (Ensemble); Obsidian Theatre: Cabaret (Kit Kat Girl), Trojan Women (Helen); Sam Houston State University: Much Ado About Nothing (Hero), The Seagull (Nina), Urinetown (Ensemble). 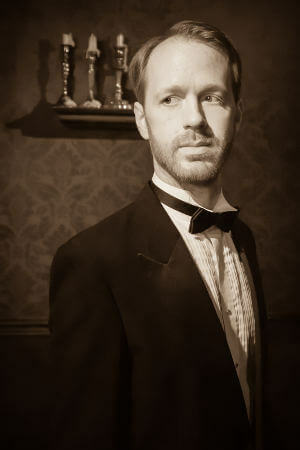 Credits may be seen by those who have successfully navigated Madame Daphne's parlor. If you haven't seen them yet, take a close look at your final souvenir.